Well, I kinda lied in my last post. Ron and I had planned to do a little birding in Allerton Park yesterday, but Ron ran into a bit of bad luck that knocked him out of the event. Probably not a bad thing in the end due to the stifling heat that we are currently experiencing out her in Flyover Country. To put it in perspective, I had Linda drive me to the Lake of the Woods Forest Preserve. I noticed a nice trail in the back of that park while getting in a 6 mile run there Friday evening. We had a couple of hours after the dog show, so took some time to see if it was worth us hitting it on our next trip over there. It is actually a pretty nice trail that runs along the Sangamon River – bad thing is after 2 miles I was soaking wet from the heat. The feels like temperature at home when we got back was 112! Fortunately, the heat isn’t a problem for today’s featured creature. That there is what they call a Tortoise. Guessing you were thinking Turtle. They are both reptiles and that is the common name associated with the hard shells, but there is actually a definite distinction between the two. 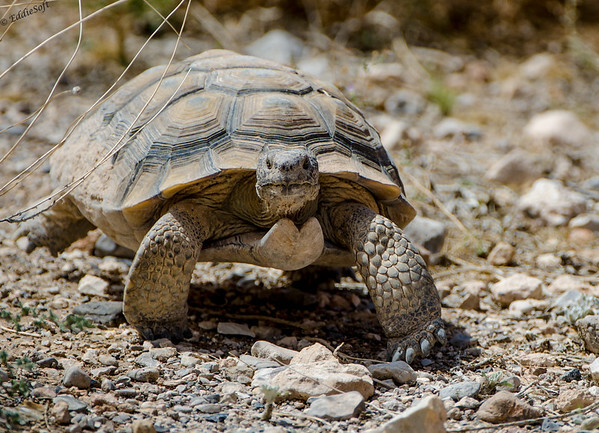 For starters, Tortoises are land dwellers, where Turtles spend most of their time in water habitats. Clearly this was the case with these specimens seeing as how we took them outside the headquarters of Red Rock Canyon in Nevada. This dwelling distinction also leads to another difference – Turtles have webbed feet and very sharp claws to navigate the water and pull themselves up on logs etc. to sun. Hit the jump to see a few more pictures and learn a few more facts picked up from some quick research. There is also another MAJOR difference between the two species. 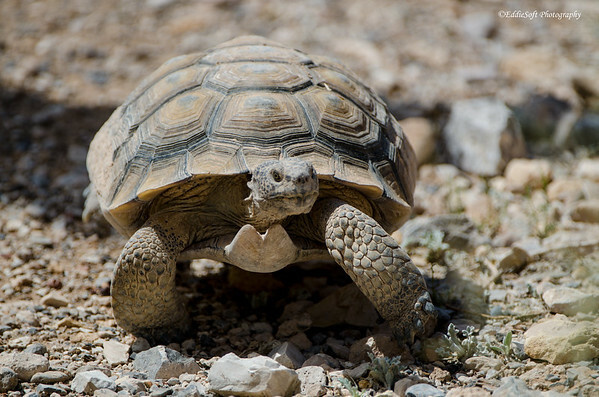 According to a website I found on Google, the Tortoise has orbited the moon – take that you earthling Turtles. I’ve heard that not everything you read on the web is true (take for instance an article I came across yesterday trying to claim Hillary isn’t a liar and a crook), but at this point I have no reason to doubt this little tidbit. Per the website, those clever Rusky space cadets shot a tortoise into outer space to orbit the moon back in 1968 in a Zond-5 probe – months before we launched our weak shelled bodies there – they lived if you were wondering. Thank me when you crush your competition at the local trivia night. 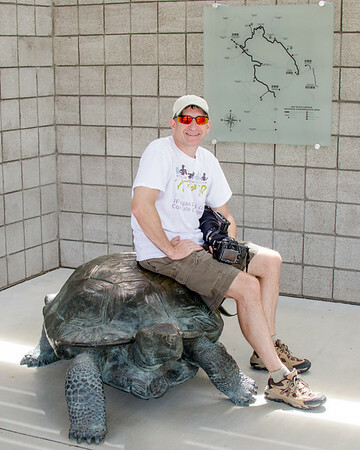 Just for comparison, thought I would throw in s Turtle – also shot in the Vegas region. Looks like something impacted his shell in the middle. As a word of caution, based on the size of that damage you might want to reconsider wading in the backwaters of Nevada – you have been warned. 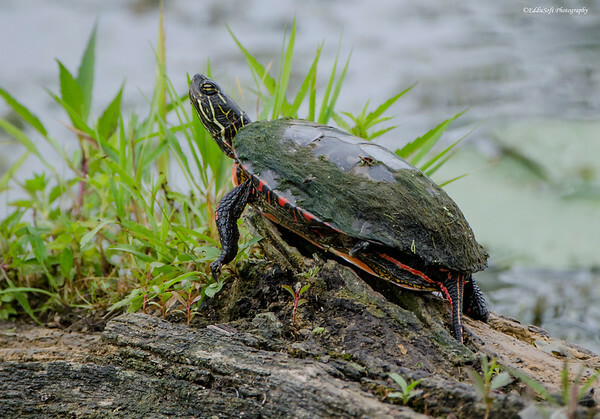 In case you are curious, this is a Painted Turtle – unlike the Red-Eared Slider variety, they do not have the red streak on the side of their face. Did I mention that some of these Tortoises are extremely friendly…..
Linda refused to let me bring him home with us … even after explaining how well they are at keeping snakes away – sigh, denied for the uptenth millionth time. Oh, well, hope you enjoyed learning about the Tortoise. Been a bit of a blast of posts as of late, but this is going to be a busy week and wanted to make sure the quota didn’t fall victim. Maybe I’ll even be able to give you some bonus posts if I need a break from all the work. Don’t sit on the turtles! What do you think impacted that turtle’s shell? A bullet? 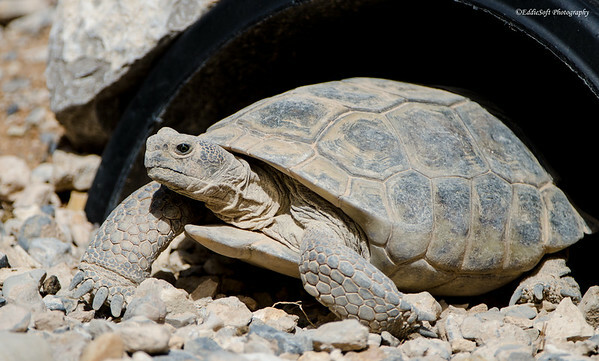 These are nice pics of the tortoise, and a nice description of the differences with a turtle. I learn something from all your posts. I got to show off my Turtle knowledge at the state fair yesterday – we were checking out the conservation world area and they had a display of those reptiles. Linda was impressed at my ability to quickly identify the red-ear vs the painted – she called me the Turtle Whisperer (admittedly that was in a sarcastic manner, but I took it as a complement). I am sure that dent wasn’t a bullet because gun owners with integrity would never just maliciously shoot a reptile – that and if it was a good shot it wouldn’t still be alive (hehehe). I am pretty sure it was an Alligator bite. Well, that is at least what I am going with because it sounds a lot more exciting than any other excuse I can think of at the moment. No worries, you could rent the turtles at the entrance and use them to get you around the park. It takes awhile, but eventually you get to where you are going.